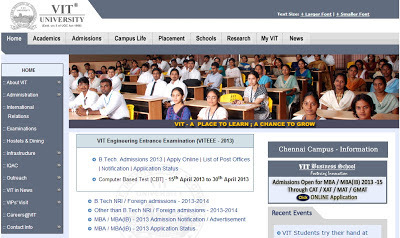 http://www.vit.ac.in/ is the official website of VIT Engineering Entrance Examination 2016 (VITEEE) conducted for admissions in VIT University, Tamil Nadu for admissions in various B Tech courses in VIT. Candidate have to visit the website http://www.vit.ac.in and click on Apply Online under VITEEE 2016. You can read the Information Brochure and Steps to be followed before filling the application online. 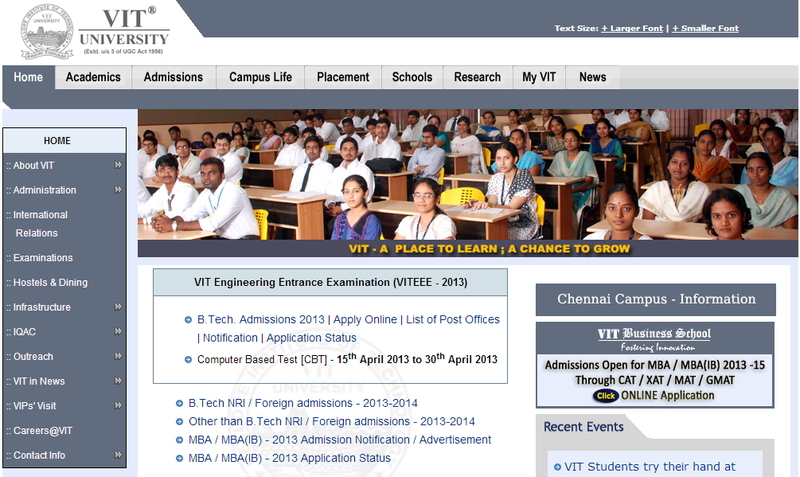 Then click on Apply online for VITEEE 2016 and click on Apply Now and Read all the Instructions and click on Apply Now. Scan and Keep a recent passport size photo (Size between 50 KB and 100 KB and dimension 3.5 cm * 4.5 cm) and Signature of the candidate (Size between 20 KB and 50 KB and dimension 3.5 cm * 1.5 cm) in JPEG Format. Follow the steps by step instruction and Make the payment of the Application Fee either by DD or through Debit or Credit card or by Net Banking or you can make payment through DD in favor of VIT university payable at Vellore. Send the DD (write name, application number, address and mobile number on the back side of the DD) and the printout of the application form to the address below and it should be reached on or before 29th February 2015. If payment is made through DD write the details in the print out of the application form and affix a recent passport size photo and sign in the prescribed location before sending. You can take another print out of the application form for your reference. Application form can be purchased from selected Post Office (refer website for the list of post offices) or by had over DD of Rs 950 at VIT university, Vellore or by sending a DD of Rs 950 to the VIT or you can Apply Online.